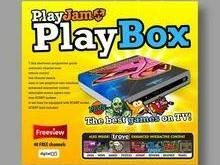 If you are a miserly skinflint who refuses to pay for ‘proper telly’ (ie Sky or Virgin) and don’t yet own one of those expensive games consoles, then you will be glad to hear that PlayJam’s games are soon heading to Freeview. UK company Static is set to launch a PlayJam-branded PlayBox to deliver the world’s largest interactive games portal via digital terrestrial broadcast for the first time. PlayJam’s 800 plus games have gained over eight billion downloads during the last five years. They are already available to non-scrooge-like paying subscribers in over 55 million TV homes across the world via Sky (UK), Dish TV (USA and India), Sky Italia (Italy), Multichoice (South Africa), UPC (Netherlands) and Astro (Malaysia). “PlayJam’s Playbox will offer the 40 channels available via Freeview together with a seven day TV listings guide, news, DVDs, puzzles, gossip, reviews, weather and travel delivered via Trove," the company's release informs us. "Over 50 PlayJam-branded games from the global games network will be available through the PlayBox including quizzes, puzzles and prize games which will be updated daily." Deals are currently being set with Freeview set-top box manufacturers and the PlayBox is expected to retail around £20 when it launches at some unspecified point later this year.